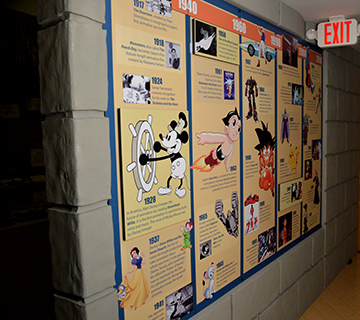 BURBANK, CA – Through the generosity of the World Wide Martial Arts Council headed by Gary Amen, the Martial Arts History Museum was proud to unveil their newest section of the Museum this week: the History of Anime. Anime is one of the fastest growing industries in the nation. Although first introduced to the West in 1958 through the film Tale of the White Serpent, Anime's biggest success came through American television and the release of such cartoons as Astro Boy, Kimba and Speed Racer. In the 1990s and 2000s, the world of Anime exploded with the release of Pokemon, Digimon, Sailor Moon and more. The success of Dragon Ball helped introduce the martial arts genre and became extremely influential in future Anime productions. In 2003, Spirited Away won the Academy Award for Best Animated Feature. The success of Anime has spawned a plethora of industry conventions such as San Diego's Comic Con which brings in upwards of 150,000 visitors. The Anime section includes an historical timeline of tracing its roots back to 1917 to the influence of Walt Disney in Steamboat Willie to Astro Boy, Ghost in the Shell, Naruto and Afro Samurai. “Although Anime is such a huge industry, few people realize how it all began and it's impact on history,” says Matsuda. The museum also introduced fans to the difference of Manga, Anime and the costume art of Cosplay. 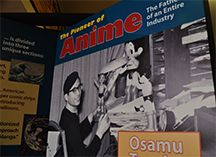 As part of their collection, the life of Osamu Tezuka, called the “Father of Manga and Anime” is featured. The Martial Arts History Museum is located at 2319 W. Magnolia Blvd., Burbank, CA 91506. Website is Mamuseum.com or call (818) 478-1722. It is a non-profit 501(c)(3) organization and is available to members and donations.